In memoria di Gabriele Salvatore. Klaus Lessmann, nato a Burghausen (Germania), vive dal 1986 a Siena in Italia. Perché no, chi non vorrebbe vivere nella ‘Bella Italia’? 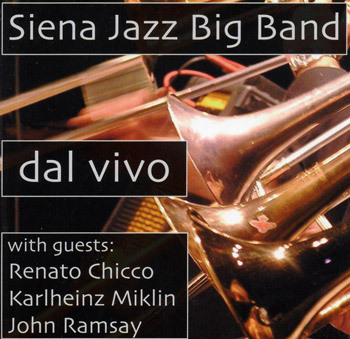 A Siena lavora come insegnante di musica, autore di libri ed è il leader della ‘Siena jazz Big Band’ con la quale ha recentemente realizzato un lavoro in studio. Ne è nato un bellissimo CD, aeroso, trasparente e caldo, appunto come la ‘Bella Italia’. Lessman is another of the soloists, unlimbering his clarinet on Reinhardt’s ‘Lentement, mademoiselle,’ Carter’s ‘Lonesome Nights,’ Strayhorn’s ‘Lotus Blossom’ (on which he excels) and ‘But Not for Me/Tadd’s Delight,’ his soprano sax on ‘Bem Bom,’ one of three vocals by Maria Laura Bigliazzi who returns from GOP (the others are ‘Frankie and Johnny’ and ‘But Not for Me’). As before, Ms. Bigliazzi has her problems with the English language and seems far more at ease on the Brazilian ‘Bem Bom,’ which she interprets delightfully. In sum, a meaningful step forward for the Siena Jazz Big Band, which continues to advance under Mr. Lessman’s able guidance. This is the debut CD of this school based big band. The ensemble was recorded in the afternoons to ensure that the ensemble was good enough and the solos were added later. The director reminded me that it was an amateur band and not to expect too much! In fact this is an enjoyable CD featuring transcriptions of classic Ellington and Basie material by the leader. … It has a feel of the Cotton Club, some great reminders of the music of the thirties and beyond. This is a laudable project and deserves support. I know the next CD will be even better as the group gain more experience of the discipline of recording.